Thousands of IT teams depend on WS_FTP for the unique business-grade features required to assure reliable and secure transfer of critical data. 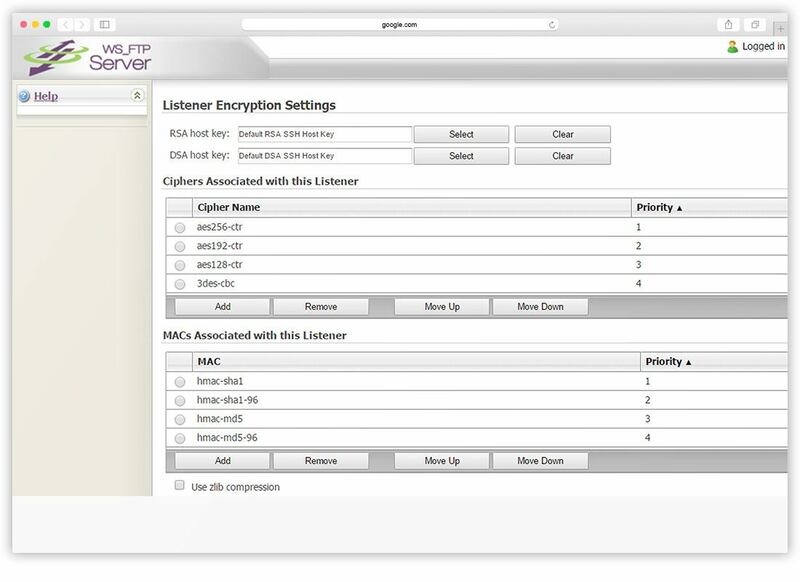 Control user access and permissions and gain real-time visibility to file transfer activities. Remotely administer or manage your server from any Internet connection. Assign user or group permissions for uploading, downloading, deleting, renaming files and creating directories. Enable file transfers over FTP, SSH / SFTP, and SSL / FTPS (Implicit and Explicit). Assure business-grade reliability and security. Advanced security features include 256-bit AES encryption, SSH transfers, Secure Copy (SCP2), file integrity, SMTP server authentication, SSL certificate support, an SSH listener option, login authentication encryption, digital certificate management, and mutual authentication of server and clients. Control file transfer activities with external authentication, LDAP queries and wide range of administrative tools for customization. Powerful admin features include support for virtual servers, end user email notification, end user folder controls and IP whitelists for end user authentication. The Ad-Hoc Transfer module enables organizations to enforce consistent policies and processes around person-to-person file transfers. When you exchange mission-critical files, downtime is not an option. Our Failover option provides reliability and continuity. Simple, Secure, and Flexible Browser-Based File Transfer makes it easy for users to upload and dowload files.. Choose the edition that fits your needs. Proven, effective, easy-to-use file transfer solution. Gaming company Rocksteady protects creative assets with WS_FTP Server. Do you have management and control over your file transfer processes? Securely store, share and transfer information between systems, applications, groups and individuals.